Gidday! I finally got back home to write a few lines about how amazing my experience was climbing Uluru (aka Ayers Rock). I did have a little thought deep inside if I should really climb due to the controversy surrounding it. But I really wanted to climb considering the fact that I would have come a very long way (from New Zealand). Well, the time arrived and boy! A simple assymetrical rock but it draws visitors from all over the world... standing out in the middle of nowhere so majestically! After the sunrise, we (there were 5 of us) set out to climb the rock and it wasn't easy. I am into a lot of outdoor stuff like hiking, kayaking over here in NZ but the climb was no easy task. I think more than a physical thing, you need to be prepared mentally. At one point, I was completely exhausted after the "almost vertical" climb of the steep rock but was determined to accomplish my mission. It took me about an hour or so to get up to the summit. What a gorgeous view of the desert from there and the sister rocks - Kata Tjuta!! And then we began to descend, which I thought was way more challenging than going up. We fought the force of gravity, the wind and the physical form of the rock which made it harder but finally finished the whole climb in under 2.5 hours. I cried and kissed the ground! I had an emotional moment there with the rock in front of me I set my foot on, smiling at me saying "will see you again in the future"
What a challenge it was but definitely worth it. 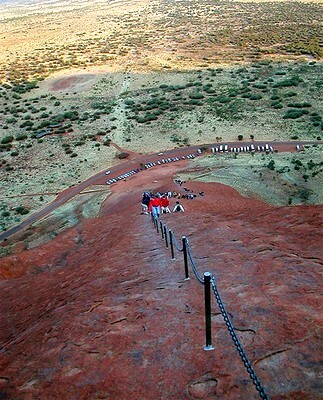 I now wish I could stay somewhere close to Uluru so that I can climb it pretty much every day and stay fit. I will definitely come back next year and try to beat my time! so it makes it ok then?? So sitting on a plane trip from new zealand was so taxing that after coming all that way you thought it appropriate to disrespect someone elses culture and beliefs by climbing the rock. You may disagree but that is no reason to get abusive. I edited your comment. State your opinions in a civilized manner or I will delete them. you not only climbed a sacred site knowing about the problems...........after you did i you think you should climb it more often to keep fit............?? this is my country too! congratulations on your climb, i too enjoyed the climb back in 2001. If the custodial people of the land are happy to charge you a fair old some of money to climb the rock i am happy to climb it. i am a 5th generation Australian and welcome anyone to climb ULURU. Enjoy! Please don,t think i am a racist by my comments but this wonderful country should be enjoyed by all as long as it is respected and kept clean. Just for clarification, the custodial people don't charge you. The NT government does. The custodial people had the choice to agree to this arrangement and get their land back at least on paper and seats on the board, or to remain totally without rights and say in matters. Also, with your entrance fee you do not buy a stake in the rock. You pay for the upkeep of the facilities that make it possible for everyone to visit and learn. The roads, the parking areas, the walks, the maintenance, the rangers etc. If you pay your entrance fee to the Louvre in Paris that still does not mean you can now do to the exhibits whatever you please. Access fee to a Botanical Garden does not mean you can collect the seeds and cut the flowers or leave the paths and climb the trees. If you pay your entrance fee for the Vatican in Rome you still don't buy the right to climb all over the altar. You pay for the costs involved to make it possible for you to visit. Your reasoning is so common. What gives people the idea that just because they pay an entrance fee now they have more right to say what goes in a place than the owner? I respect your and anyone's decision to ignore the wishes of the traditional owners. It's only a request for respect and not a rule. It's your decision to make. I also do not want to argue over whether it should be allowed or forbidden to climb. But I object to your reasoning that paying the entrance fee means you bought the moral right to climb. Respect it. Climb it. Respect it more. Move on. Paying an entrance fee and paying our taxes DOES give us the moral right to have a say on how the area is managed and the activities that should be permitted. The Government is spending OUR money. It does not give us the right to disrespect or damage the environment. Do not compare Uluru with a Church or Temple or the Vatican. These are man made and came AFTER the religion and were made for a specific purpose. Compare it with other natural features like the Half Dome at Yosemite or Victoria Falls. Uluru was there long before the Aborigines started making up stories about it. And will be there long after we are all gone. It is against the discrimatiion act for landlords to deny access to tenants based on religion or culture. Imagine the trouble a landlord would get into if they said you can rent the house but you can't have any Muslims or Jews or Christians visit. Everywhere the "white man" enjoys the outback is sacred to the aboriginal. HI there. Their land was used by the government which in turn let people climb the rock. Then after much lobbing they were given the land back. Then five minutes later they signed a lease for a annual fee KNOWING that in that lease they allowed the rock to be climbed. I know if I had something sacred taken away from me for years and after much lobbying I got it back I would not then turn around and lease it to the very same government that took it away from me in the first place and give it back. Just so I could get $$$$$$$. The entry fee does go to the upkeep. However, it also goes to repay the government that they had to give to the local people for the lease. Perhaps the local people if they do not want people to climb the rock then they should not hold their hand out for the lease money.